How concerned is the U.S. Army Corps of Engineers about the integrity of Addicks and Barker reservoirs? The agency has never answered the question clearly, but documents offer new clues. Just how worried is the U.S. Army Corps of Engineers about a possible failure of the Addicks and Barker dams? And how worried should Houston be? The agency has long been criticized for providing few specifics on that issue, even after it found voids in the walls of the dams years ago, and classified them in 2009 as "unsafe" with an "urgent and compelling" need for action. Both dams withstood Hurricane Harvey's historic floods a month ago, but the Army Corps, which operates and maintains them, is offering little information about how the added stress may have affected the integrity of the dams — or how worried they were about them failing during the storm. 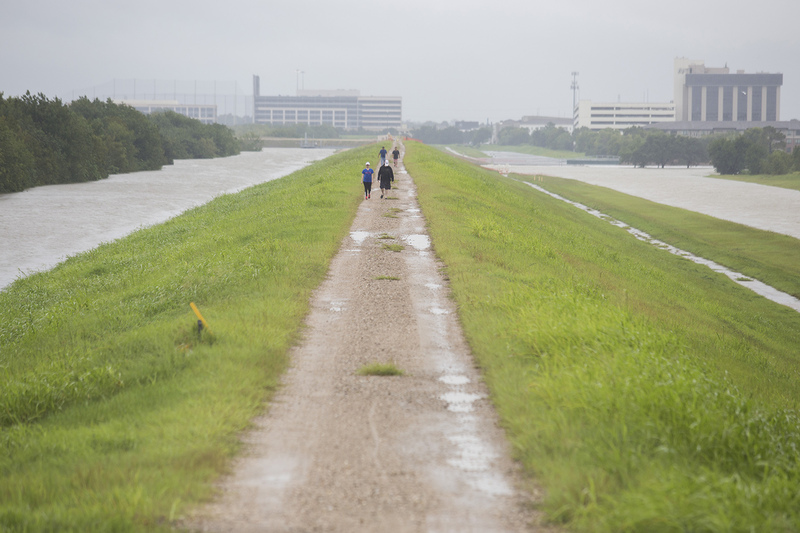 The two earthen structures in west Houston, built by the Army Corps in the 1940s, are designed to hold floodwaters and protect central Houston — but only during major rainstorms. The land behind the dams is dry most of the time, dotted with parks, soccer fields and other recreational areas. Want to help us cover the aftermath of Hurricane Harvey? Find out how you can help here. Now both dams are holding back billions of gallons of floodwater from Harvey that will take months to safely release — something they weren't designed to do for more than short periods. Another Corps document, this one from 2010, shows that the agency was using terms like "risk of catastrophic failure" for the dams for flood events much smaller than what Houston experienced during Harvey. That 2010 "interim reservoir control action plan" sets what it calls "maximum pool" levels for Addicks and Barker at elevations well under 100 feet, levels that could be expected during a 25-year storm — which has a 4 percent chance of occurring in any given year. Such a storm is about 30 times more common than the rains generated by Harvey. "The purpose of this ... is to reduce the risk of catastrophic failure by [releasing water from the dams] quicker and increasing embankment surveillance," the document says, adding that at 25-year levels, the dams "need to get additional attention." The document, which also became part of the 2011 Sierra Club lawsuit against the Army Corps, doesn't specify what the true risk of dam failure might be at such levels. It also doesn't say what exact actions the Army Corps would take when water reached that point. How the Corps reacts to rising water in the reservoirs has become the focal point of questions — and now lawsuits — following Harvey. Despite the Corps' reassurances about the dams during Harvey, many have wondered whether the fear of dam failure was the main factor in the agency’s decision to release an unprecedented amount of water from the reservoirs, which caused thousands more homes to flood downstream than otherwise would have. In public statements, the Corps indicated that some of the “controlled releases” were done to relieve stress on the dams. But it mostly said it was concerned that water would spill around the sides of the dams and be harder to control. To Cynthia Neely, whose house flooded mostly due to the downstream releases, the reason is clear: “If the dams had failed, there wouldn’t be a Houston at all,” she said. Corps officials declined to answer most questions about the 2010 document and its flood response procedures, citing lawsuits it is facing over how it operated the dams during Harvey, but they said the document is outdated. Still, newer documents only reiterate that the Corps continues to be concerned about the integrity of the dams: "Studies conducted since 2004 have determined that the existing dams ... are a high risk of failure due to seepage and piping issues," the agency wrote in an undated report that references actions taken as late as 2012. Blackburn said the failure of the Army Corps to make the 2010 document public is just one example of the agency's hesitance to address the risk of a dam breach. "I think they have not wanted to have an honest conversation about it, for some reason." Matthew Zeve, the Harris County Flood Control District’s director of operations, said he had not seen the 2010 document before the Tribune sent him a copy. But he said he didn't think the document expressed concern about the dams actually failing at such low water levels but rather indicated a "trigger" for when the agency should be continuously monitoring the dams and doing whatever it can to diminish risk. Even though the documents indicate the Corps was concerned about a 25-year rain event, the dams held up during Harvey, which was was an "800-year" storm, and in April 2016 they handled the Tax Day flood, which also pushed the reservoirs to levels far higher than the 25-year threshold. But both of those floods created huge lakes behind the dams that would stay in place for months, and the Army Corps has long said that could be a problem. In a 2016 interview with the Tribune, Richard Long, the reservoir project manager, said the reservoirs "were never intended to hold pools as large or for as long as they have in recent years." Another Corps official, Robert Van Cleave, added at the time: "As the pool rises, that increases pressure on your foundation. As that happens over time, and the repetitive nature of the pools going up and down, that causes stress the original designers didn't anticipate." After the Tax Day flood, it took months for the Corps to drain the reservoirs, and it will take even longer after Harvey. In its most recent manual for operating the reservoirs, the Corps noted that "prolonged storage of rainfall" behind the dams in the past has "resulted in a serious seepage problem" through the permeable sections of the dam's walls, which are largely made of clay and sand. The Corps has plugged some of the voids where seepage might happen, but officials have said that many of those solutions are just "temporary measures." 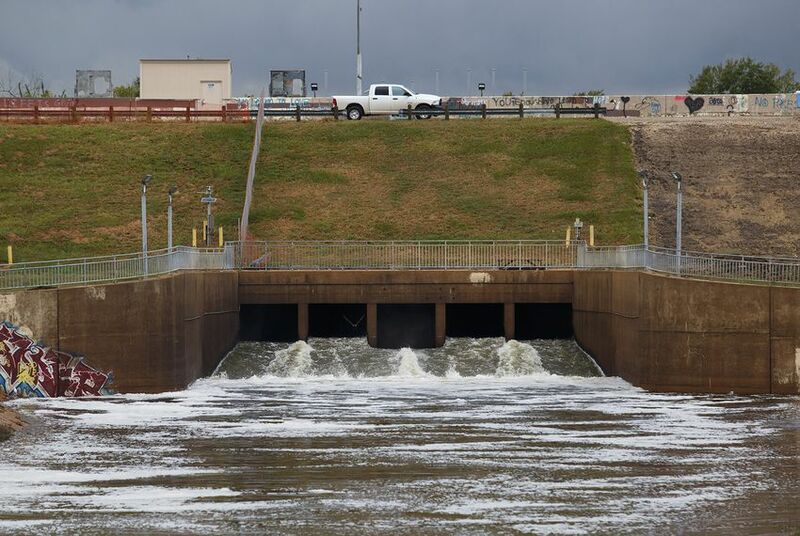 Since 2009, the Army Corps has identified more than $100 million in major repairs needed in order to safely maintain the dams in the long term. Not all of those have happened yet. In 2015, a $74 million project to replace the dam's gates — sometimes known as "outlet works" — began, but the Army Corps said in mid-August that the project wouldn't be complete until February 2020. Now, after Harvey, the agency says the completion date has to be pushed back further. It’s unclear how much local and state officials have discussed the possibility of a dam failure. Asked if he had concerns about the integrity of the dams, Houston Mayor Sylvester Turner told the Tribune in an interview this week that he hadn’t studied the issue and that was a determination for the Corps to make. Lt. Gov. Dan Patrick, who is from Houston, said in an interview that he asked the Corps about the prospect of dam failure in the "critical days" during Harvey and was told it’s not a concern. “If they were worried about imminent failure, then I think they would be doing the responsible thing and telling the governor and telling me,” he said. Leonard Waterworth, former commander of the Army Corps' Galveston District, said the agency has done everything it can to address the issue but has been hamstrung by an uninterested Congress. "Congress has the power of the purse string," said Waterworth, who is now a professor at Texas A&M University in Galveston. "So if it's important to Congress, they're going to fund it. If not, we need to find out another way to protect our people."